Elizabeth Prendiville of Saffronart discusses the new upward trend of female watch designs at the Geneva Watchmaking Grand Prix this year. Boucheron Ajourée Héra jewellery watch, shortlisted for the Jewellery Watch award. New York: In years past men’s watch designs have completely dominated the market for fine timepieces. Specifically, at the Geneva Watchmaking Grand Prix which documents the strongest designs and most pivotal trends of the year in watches. Designers such as Chanel, Chaumet, and Boucheron are among the lush collection of awarded designers. However, this year more award categories are devoted to feminine designs. This could be because more of these ladies’ watches are getting accolades for their beautiful design and function. The feminine finalists for these awards cover four out of ten of the main categories. This is a staggering amount compared to past years. 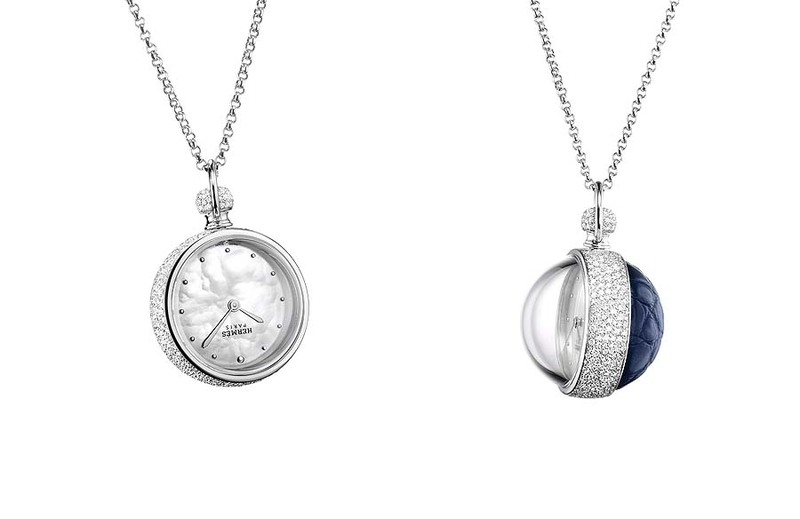 Hermès Pendentif Boule pendant watch, shortlisted for the Ladies’ Watch award. The most notable women’s watches of the 2013 Grand Prix include interesting aesthetics in partnership with age old traditional crafting and inventive new concepts. The Hermes Pendentif Boule pendant watch has received much attention for achieving this perfect balance. Rather than being adorned on a traditional wrist bracelet, this unique piece, which includes blue alligator leather, is displayed on a long chain rotating freely. In addition to this inventive design work, some featured watches gracefully skirt the line between jewelry pieces and timepieces. 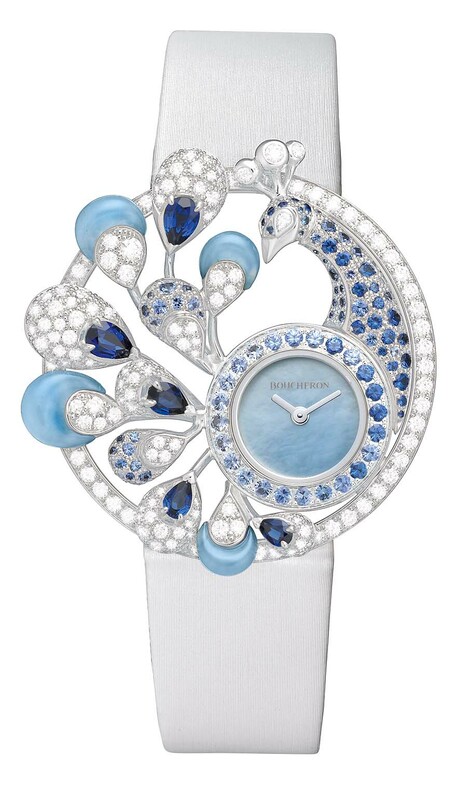 Bocheron Ajouree Hera jewellery watch, featuring a fantastical blue peacock made of sapphire and diamond is a perfect example of this. 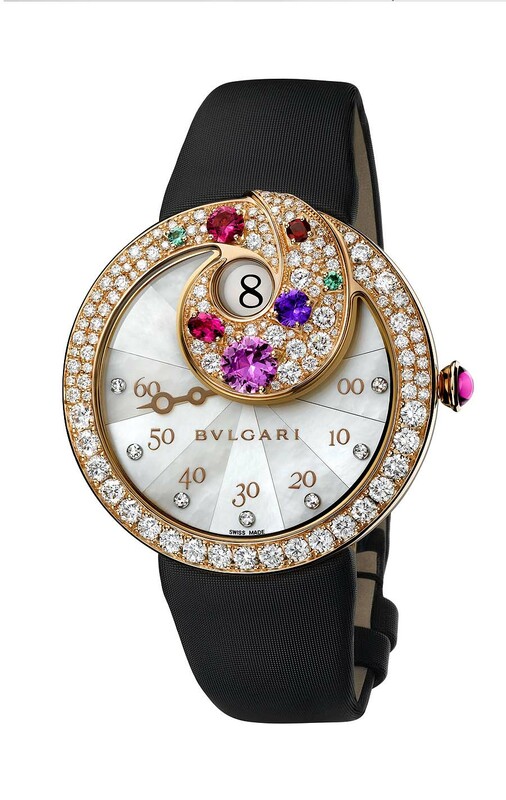 It was shortlisted for the Jewellery Watch Award alongside the Bulgari Jumping Hour Retrograde Minutes jewellery watch, which features a swath of precious colorful gems. Bulgari Jumping Hour Retrograde Minutes jewellery watch, shortlisted for the Jewellery Watch award. The winners of the 2013 Geneva Watchmaking Grand Prix will be announced at the 13th prize-giving ceremony on November 15th at the Grand Theatre de Geneve. Due to these stellar pieces feminine watches are sure to have a strong hold on the award-winning watch market for years to come. To learn more about the finalists for the 2013 Grand Prix, click here. Wow!!! beautiful watch. I love it.